Our gorgeous god daughter’s christening was last weekend (yep, she was so cute in her lace gown! ), and I wanted to mark the occasion with something special. At first, I was planning on stitching her a monogram initial from Bible De Lettres A Point De Croix, Tome 1, which would be the first thing I had stitched from this wonderous book, but there was no way I would get it finished in time for the christening. Myah’s first birthday is on the 20th December though, and I’ve now expanded this project to stitch her whole name as a kind of door plaque for her bedroom. 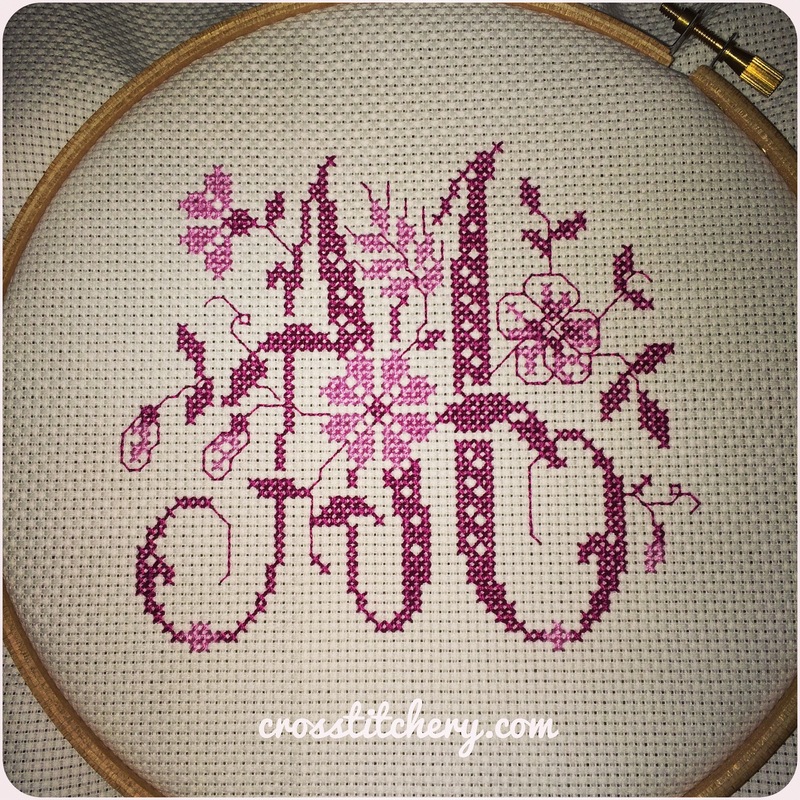 I’ve chosen 2 pink tones to stitch her name in – dark pink for the bulk of the letter, and light pink for the embellishments. Here’s a progress shot of the ‘M’ for you – 1 letter down, 3 to go! That turned out so beautifully. I really like your idea for her first birthday too. Thank you! I was pretty disappointed I wasn’t able to finish this in time for her christening, but rushing it probably would’ve have been the best idea either! You’re so lovely – thank you!! absolutely stunning!!! is that pattern from the bible tome book? Will have to see if my local library has a copy to look through :-). I gave two nieces I would like to make something with initials on. That’s a great idea! Hope your library has it available for you.